Growing up I spent the summers between school terms visiting my sisters in Utah, or Mississippi, or Tennessee, creating some of my fondest memories. One summer I remember, I broke my sister Tina's glass blender. They lived in a small remote town named Magee, in Mississippi about 45 minutes outside of Jackson, on one acre of land. Typically they hired a company to come with riding lawn mowers to cut the grass periodically, but the week I (let me make sure to mention - accidentally) broke the glass blender I received the pleasure of mowing the grass, by hand, with a push mower. Let me also make sure to mention again that this is Mississippi, deep, hot south, land of the fire ants. I had completed the front yard, stepped in 3 ant hills, my feet were swollen from ant bites; I walked inside and fell to the ground, "I can't do it," I sighed and cried and lamented. I distinctly remember my sister's response, "You know, when I was your age I never let anyone or anything tell me I couldn't do something! I could do anything." I changed out of my flip flops and finished the back of the yard. Okay, maybe this memory isn't as fond as others. More importantly that same summer, Tina's kids and I were crazy about this one particular sesame street video. It was the 50th Anniversary video, and we watched it non stop day after day after day. I still love it! When a local Toys R Us store was going out of business a few years back, it was the first item in my shopping cart! One of the classic songs on the video is: I'm an Aardvark! I'm an aardvark, and I'm proud! I'm an aardvark, and I'm happy! I am feeling quite terrific! I'm an aardvark, fierce and free! I'm an aardvark, standing bravely! Every time I hear this song, I think of chocolate chip cookies. I don't know, I can't explain it. 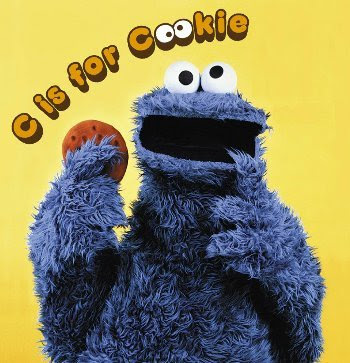 I'm a cookie, and I'm great! I'm a cookie, and I'm delicious! I am merely quite terrific! 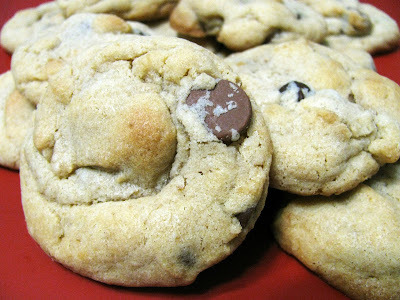 Chocolate chip cookies are just simply delicious. They are quick and easy, and never disappoint. 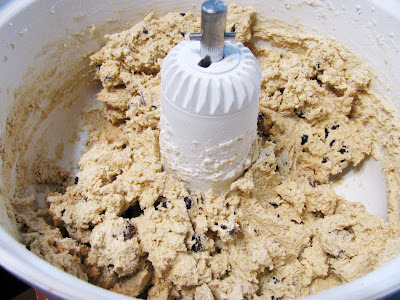 Scoop 4oz or more of dough onto a buttered cookie sheet, spread dough equally apart, and bake at 350° for 7-10 minutes. Wait 30 seconds, and transfer to cool on a paper towel (the paper towel will absorb any oil/butter from your pan). I made these cookies primarily for a little friend of mine, Madyson, who is sick! But I made a second batch to bribe my primary class, which unfortunately didn't work as well as I had hoped. The 4oz cookies are perfect for parents or primary teachers, because they are the perfect size for little ones. Plus - you can feel better about giving them several, because while the kids think they are getting tons of cookies, you know they are truly only getting the equivalent of 1 or 2.
anyways, love you catherine! you are so wonderful!!! and, oh my! pushing the lawn mower!? goodness! that sounds HORRID! (and quite a good workout!) love ya! Not at all! You were right - I shouldn't give up! And every day when I'm running and I want to give up, I tell myself: "You aren't pathetic! You aren't pathetic!" You taught me a lot!